The St. Louis Cardinals have placed pitcher Chris Carpenter on the 15-day disabled list, one day after he had to leave a game with a pulled left rib cage muscle. This guy has thrown fewer pitches in the last few years than Yogi Berra. That’s not a joke. Carpenter missed virtually all of the last two seasons with elbow and shoulder injuries. 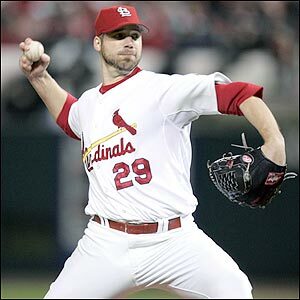 He was the NL Cy Young Award winner in 2005. This guy has gotten paid $13.5 million over the last two years to ride the pine and will get paid $10.5 million this year to do much of the same. My heart goes out to the Cards fans because if anyone knows about wasted money it’s the Red Sox with the likes of Julio Lugo (and his wayyy overpaid contract) and Matt Clement (who I’m fairly certain, I never actually saw throw a pitch in a Sox uniform). You are currently browsing the archives for the Yogi Berra category.